Starting with ISTE standard #1 Facilitate and inspire student learning and creativity, this standard promotes open-eneded questions and encourages creativity. In my classroom I would engage my students in meaningful discussions about current events with technology. Using a class blog or website would be a great idea to get students involved. By using a weblog this can bring innovation to the classroom. It allows students to explore their own interest while engaging and collaborating with other students. I found this website called http://kidslikeblogs.org that shows just how powerful blogging in the classroom can be. ISTE standard #2 Design and develop digital age learning experiences and assessments, this standard is all about how teachers develop and promote technology to flourish in the classroom. As a future teacher I wouldn’t just use the computer I would engage students by using a smart board or Skype. There are so many apps and digital teaching strategies you can use to further your knowledge http://www.westada.org/Page/2095. Skype is a great way to communicate with other colleagues. Also I would have students come up with ways to deliver lessons based what we are learning in class by using digital devices. Then students can give feedback at the end of each lesson that is presented. 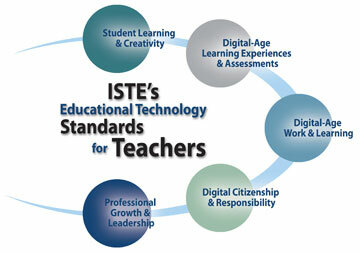 ISTE standard #3 Model digital age work and learning, this standard is about the teacher demonstrating, motivating, modeling, and collaborating with the students. For this standard I would design an online classroom for students and parents. This would allow everyone to collaborate online if they have any questions or comments. I would provide helpful links for homework and grades as well as updates and reminders so students and parents are all up to date with content that is covered in class. I feel that it is extremely important to not only motivate your students learning process but to inform and engage their parents as well. Everyone must collaborate to have a successful learning environment. ISTE standard #5 Engage in professional growth and leadership, This standard states that “learning never ends.” It is important as an educator to always engage in profession growth. I would attend conferences and peer meetings to further my education. I would also use social media sites such as Pinterest to learn about new teaching strategies and tools to use in the classroom. As a future educator I hope to grow and gain new knowledge. I also hope to educate and inspire my peers. Thanks for sharing all those great websites! I plan to take a closer look and hopefully use them in both the classes I work in now and my future classroom. I also agree that it is important as a teacher to never stop learning. I like the idea of using Pinterest to get even more creative ideas to help in teaching. Hello Lauren! I loved all the links you provided and I hope to explore and apply them later on as a teacher. Thank you for those. I especially loved the responsible tech use agreement, it is always great to know that parents are on board and well informed about what their kids should and shouldn’t be doing on the web. I can tell that you are going to be a great teacher! WOW! I thought the video about 4th and 5th graders blogging was so interesting. It just seems so crazy that kids so young have a blog. It is so amazing because we did not have these resources when we were kids. I really like how it is getting kids to write more, but I fear that it is going to be our downfall in spelling. I can not believe I did not think of pinterest! It is an amazing resource, and I use it all the time when coming up with projects for my son.